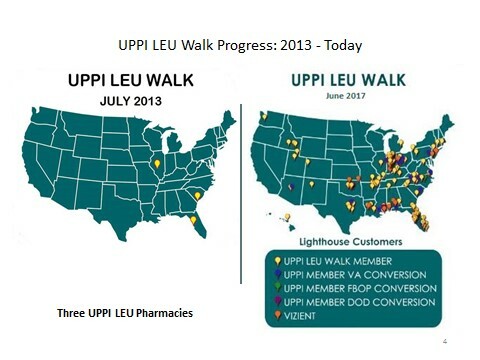 SUWANEE, GA--(Marketwired - August 28, 2017) - UPPI LLC announced today it presented an update on the UPPI LEU Walk and initiatives to transition to non-HEU (non-Highly Enriched Uranium) medical isotopes at the Organization for Economic Cooperation and Development (OECD) Nuclear Energy Agency's (NEA) 4th Meeting of the 4th Mandate of the High-level Group on the Security of Supply of Medical Radioisotopes (HLG-MR) in Paris France this past July 12, 2017. UPPI spoke to its continued expansion of availability of non-HEU (or LEU-low enriched uranium) Technetium 99m (Tc 99m) unit doses, the most commonly utilized nuclear diagnostic imaging radiopharmaceutical, in the United States and efforts to expand reimbursements to hospitals that support their efforts to help end the proliferation of HEU in medical isotope production. "The UPPI LEU Walk initiative has grown in the last three years as the supply of non-HEU Molybdenum 99 improves and UPPI's outreach with private insurance payers continues to assist coverage of the Q9969 added-on reimbursement for the use of non->95% LEU Tc 99m involving all covered lives," said John Witkowski President. Mr. Witkowski spoke to the HLG-MR delegates and other representatives on the need to move forward Full Cost Recovery, Principle One of the Six Principles adopted by the HLG-MR, for production of non-HEU medical isotopes and that reimbursement, in the United States, for radiopharmaceutical costs should reflect current prices at the nuclear pharmacy prescription level. "The current reimbursement model is far behind actual drug price increases in the market and it needs to be changed to allow hospitals adequate reimbursement for the acquisition costs of nuclear pharmaceuticals in a time of non-traditional, annual increases, especially those increase involving sole-source generic products." UPPI will be presenting a further update entitled the UPPI LEU Walk: Implementation Strategy on the Verge of a Supply Chain Converted to non-HEU Medical Isotopes at the 2017 Mo-99 Topical Meeting on Molybdenum-99 Production, Technology and Development on September 12, 2017 in Montreal, Quebec Canada. A white paper on radiopharmaceutical pricing in SPECT (Single Photon Emission Computed Tomography) imaging co-authored with Vizient, Inc. will be forthcoming in the fall. Established in 1998, UPPI is an alliance of independent commercial radiopharmacies and leading non-profit academic medical center radiopharmacies, which are focused on delivering prepared radiopharmaceuticals for diagnostic molecular imaging and therapeutic patient care needs. UPPI national reach provides daily and on-call radiopharmaceuticals in metropolitan, secondary, tertiary, and rural market places. Each day UPPI member and affiliate pharmacies provide over 8,000 unit dose prescriptions for diagnostic imaging and radiotherapy to nuclear medicine physicians, radiologists, nuclear cardiologists and oncologists. The UPPI network includes 77 radiopharmacies and academic radiopharmacies and 11 cyclotrons for the production of Positron Emission Tomography (PET) radiopharmaceuticals. UPPI is committed to delivering outcomes, solutions and strategies in patient critical products that extend health and wellness.